Ebby Nelson-Addy in action against Carlisle United. 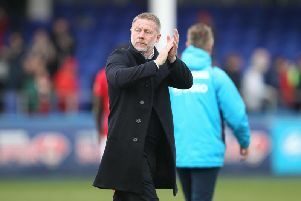 IF Hartlepool United’s younger players don’t learn from this season, then they never will. That is the view of Pools boss Ronnie Moore after a rollercoaster campaign that almost ended with the Sky Bet League Two club dropping into non-league. Pools had one foot in the Conference after spending five months at the bottom of League Two, 10 points adrift of safety, with just 11 games to go. But four straight wins and a draw in March lifted Pools out of the drop zone and they secured their status as a league team with a game to go. And the Pools chief says the younger squad members – including Dan Jones, 20, Scott Harrison, 21, Brad Walker, 20 and 23-year-old Michael Duckworth – need to draw on the experiences of this campaign, to ensure it doesn’t happen again. Moore told SportMail: “If they don’t learn from this season, then they will never learn from football. One youngster Moore hopes will improve in time for the new 2015-16 season is former Aston Villa youth Ebby Nelson-Addy. Moore handed the winger his first start in the season finale at Carlisle United but he was hooked after less than an hour. The 22-year-old had impressed in training and reserve fixtures and Moore has highlighted him as one for next season, after finding a way back into professional football with Pools. Moore added: “Ebby found it hard, that’s been my feeling. “He needs fitness work and the game [against Carlisle] passed him by. * HARTLEPOOL United fans will be able to watch highlights of their team in action every Saturday night at 9pm from August. Match footage, including every single goal, from matches in all three divisions of the Sky Bet Football League will be broadcast in a new 90 minute show aired at 9pm every week. Channel 5 will also broadcast highlights of the Capital One Cup and Johnstone’s Paint Trophy. The Football League’s chief executive, Shaun Harvey, said: “This is an exceptional opportunity for The Football League to work with a broadcaster that will schedule our matches in a prime time slot. The highlights had previously been shown on the Football League Show on BBC One, after Match of the Day, meaning Football League fans had to stay up late to watch highlights of their team in action.